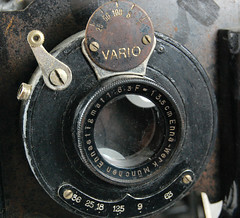 Enna or Enna Werk was a small German optics manufacturer, based in München, active from 1920 to 1992. 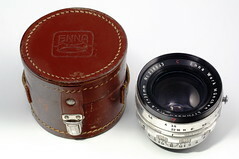 Enna made lenses for a number of German camera manufacturers and retailers, most notably Alpa, Balda and Porst. The company still exists, but has stopped producing camera lenses. They are now based in Wegscheid, where they manufacture plastic injection moulding equipment. Dr. Siegfried Schäfer was the primary design engineer at Enna Werk and responsible for many of the Enna lens designs. Some of his designs are based on drafts by Ludwig Bertele, designer of the Ernostar and the famous Sonnar. In the 1950ies and 60ies Enna was quite innovative. In 1953 they were the first one in West Germany who produced a wide-angle lens with retrofocus design for 35 mm SLR cameras, the 4.5/35 Lithagon. It was followed by the world's fastest 35 mm wide-angle, the 1.9/35 Super-Lithagon, in 1958. In 1961 the first in Germany designed telephoto zoom-lens was introduced, the 4/85-250, a very impressive lens. See their 42mm screw lenses and their Exakta lenses. They also made lenses in 39mm screw mount sold by Corfield for the Periflex, and at least one - the Ennaston 85/1.5 - in the same mount under their own name. 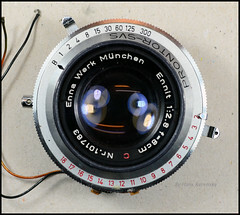 In 1958 Enna introduced their Sockel-lenses (Sockel: socket) for 35 mm SLR cameras, a system where various lens units can be mounted to different camera mounts by an adapter, similar to the later Tamron Adaptall system. The adapter is capable to close the diaphragm and includes the focusing thread. There are two versions of this system, the second one was offered from 1964 to 1967; they are incompatible with each other. Version 1 is semi-automatic, the diaphragm has to be cocked seperately. Twelve different lenses can be attached, the range of the focal length is from 24 to 240 mm, adapters were made at least for the Exakta mount and the M42 thread mount. Version 2 is fully automatic, ten different lenses within the same range of focal length were offered. Adapters for Alpa and Miranda cameras were added. This page was last edited on 17 April 2019, at 12:47.